Have You Heard? Maple Leaf Tavern is Opened! I’m a big fan of historic venues. There’s something special about being in an establishment that has withstood the test of time. Oh, if only the walls could speak, what colourful stories they would tell. 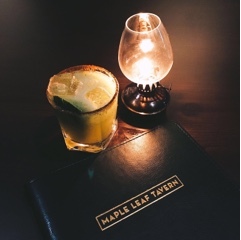 Touted as one of the oldest bars in Toronto, the recently-renovated Maple Leaf Tavern (MLT) is one of these fascinating spaces. Built in 1910, this Leslieville dive bar has been given new life and reborn as a gastropub by the owners of Pickering’s Port Restaurant. 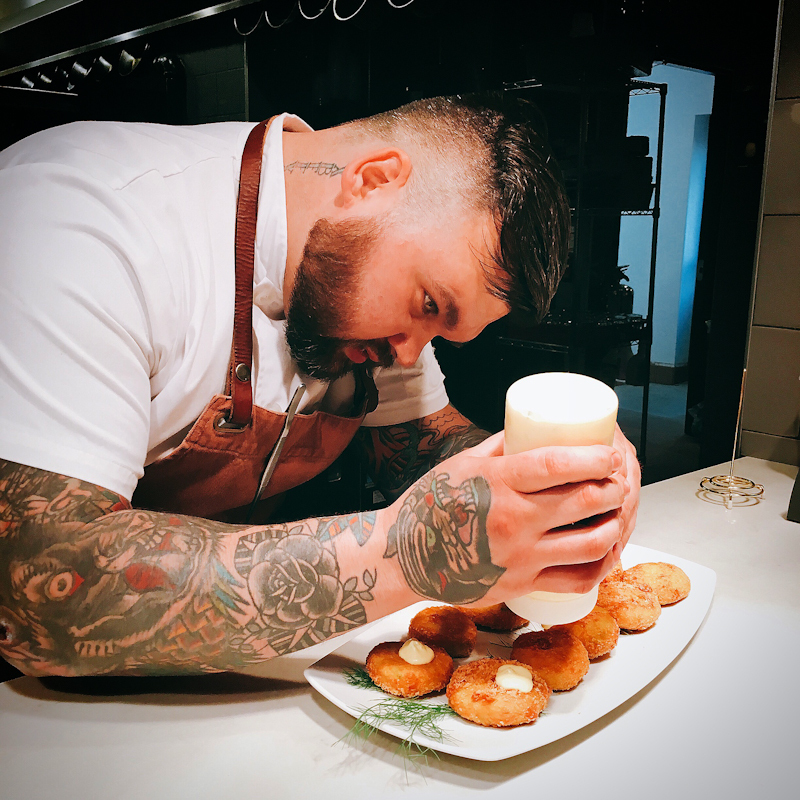 MLT also boasts three popular city chefs at the helm – Executive Chef Jesse Vallins (one of only a few Canadians who is certified as both a sommelier and a cicerone) is joined by co-chefs du cuisine Binhan Nguyen and Jonny O’Callaghan. 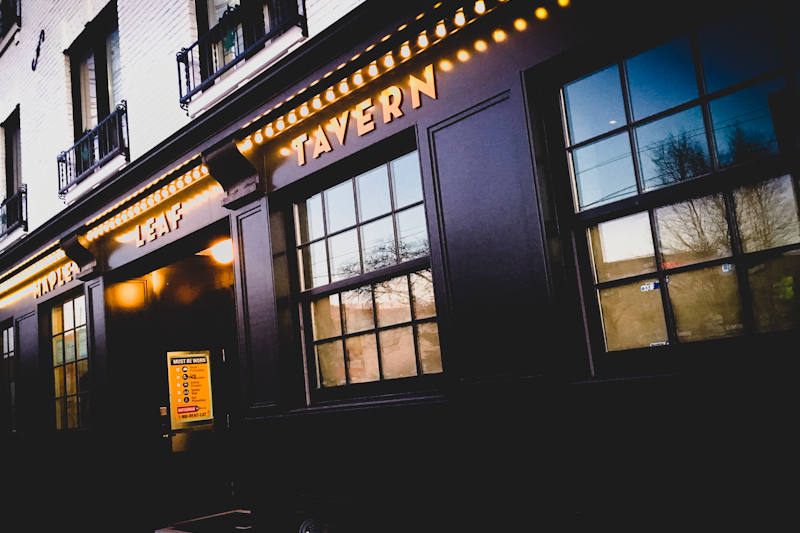 While the original space underwent substantial structural renovation, the owner’s goal was to retain a classic and timeless tavern feel, reminiscent of MLT’s thriving heyday. The tavern has achieved just that, creating a homely space that’s perfect for a meal with friends, or post-work drinks with your buddies. 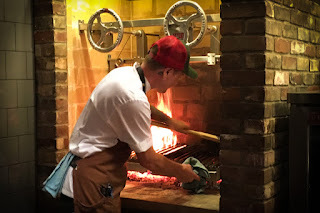 At the pre-launch media event, guests freely flowed through all three dining areas: the well-lit main dining room, the more intimate (read: darkly lit) pub area with its cosier booths, or the private dining area and chef’s table where you can experience all the action in the open kitchen. 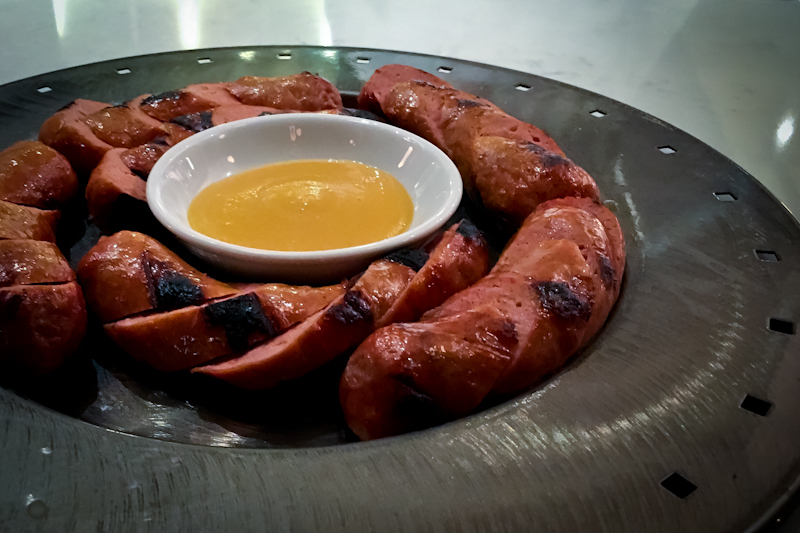 I’m not sure if it was the friendly bartender blending a Hotel Nacional cocktail, or me watching the Reuben sausages being carefully turned on the wood-burning grill, but I’m finding this resurrected tavern incredibly warm, rustic and very comfortable. And while I was half-expecting just beers and wines on the bar list, MLT offered up a selection of interesting cocktails that paired nicely with the appetizers. 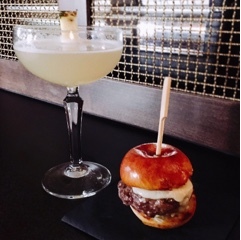 The main highlight (well, for me at least) were the sliders – amazingly juicy mini patties of striploin beef served on soft brioche buns. 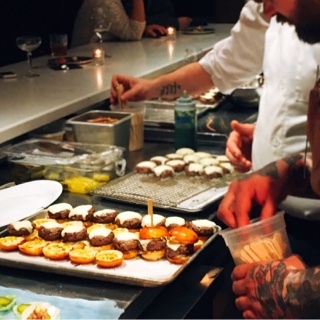 As I watched the chefs lovingly prepare each slider, I gazed longingly, trying to imagine what that first bite may taste like. 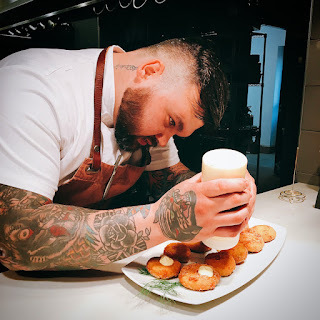 I’m guessing Chef Vallins caught my yearning stare as he grabbed two sliders and popped them on a plate for my friend and I to enjoy…much to the envy of others. But that was exactly the kind of attention and passion that the MLT crew put not only into their service, but also the food. 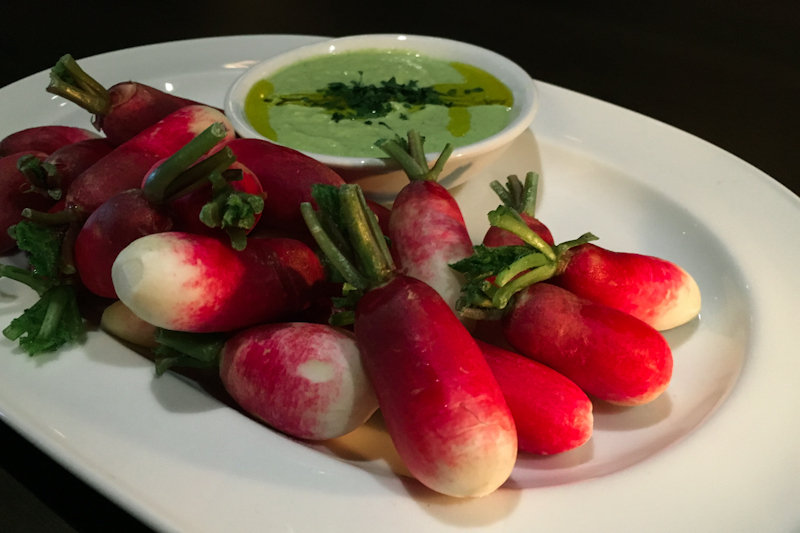 Classic pub fare has been beautifully transformed into delectable creations, clearly made with a lot of heart and soul. The food is…in one word…homely. 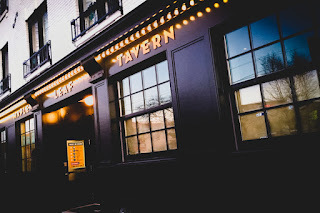 While the east end of Toronto is not known for its upscale dining options, I have a good feeling that the Maple Leaf Tavern will prove to be one of those places that will really revitalize the neighbourhood and the community.